The conference ASSETS’16 (which was held this year in Reno, Nevada) aims to design and evaluate computing technologies for people with disabilities and older adults. 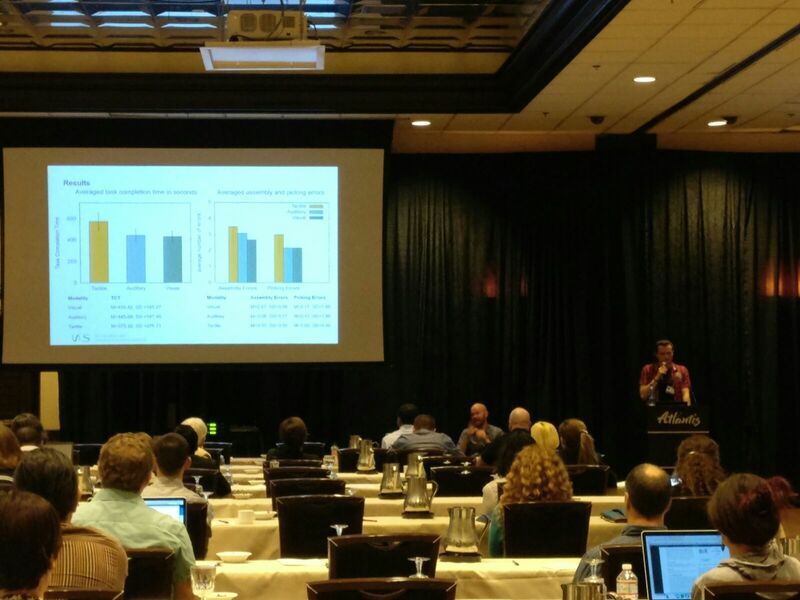 The conference offered interesting publications, talks, and an awesome community. 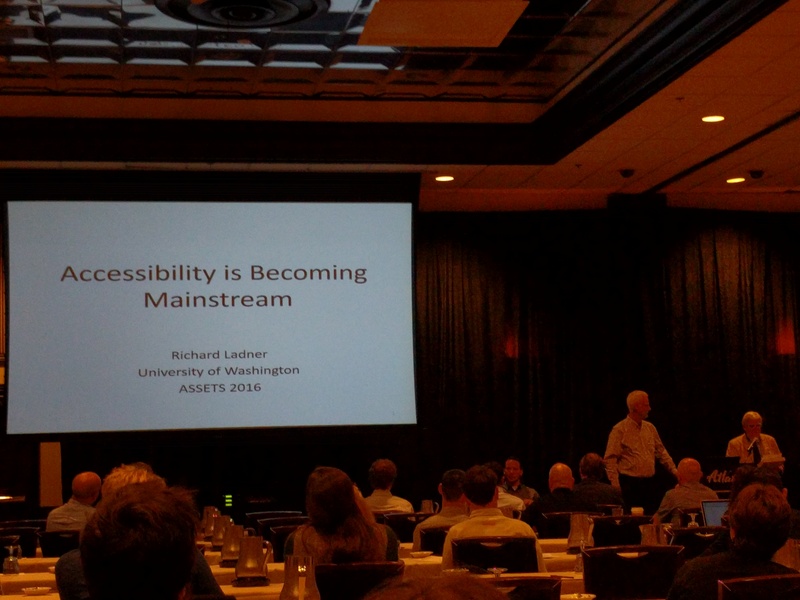 The keynote by Richard Ladner addressed accessibility as a field of research which can not be ignored anymore. It is becoming mainstream and therefore it is important to design computing systems with accessibility aspects in mind (see Figure 1) . Proliferating this philosophy enables people with disabilities to solve daily tasks, which would be hard to do without using appropriate computing technologies or developing new communication techniques. I myself am fascinated on how blind people can read using tactile interfaces. This is not only limited to reading text and can be used to solve mathematical equations (see Figure 2). Have you ever wondered how it is to be color blind? MacAlpine and Flatla  developed a system to simulate color blindness for making it accessible to others. Making fellows aware on how they visual perception works can be used to remodel existing visual stimuli to improve their accessibility. 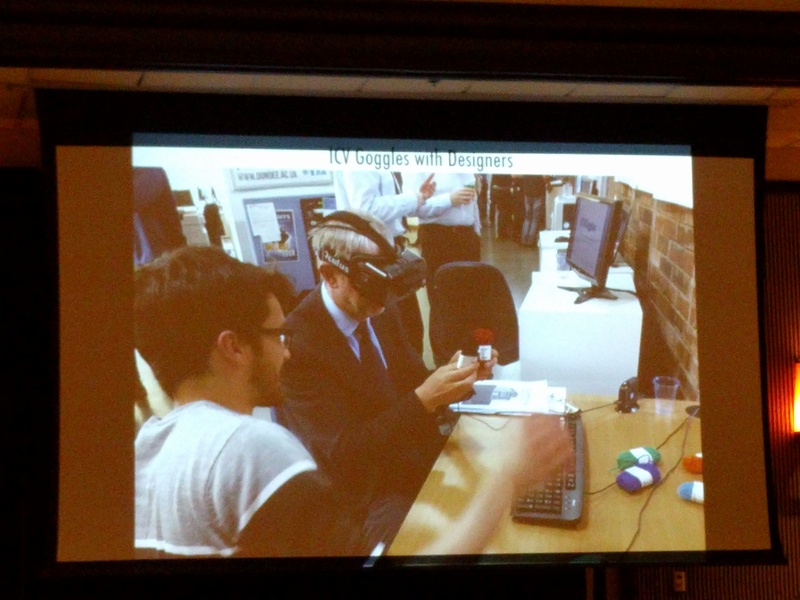 Furthermore, they presented a goggle which shows how color blind people perceive their environment (see Figure 3). Another interesting talk from Michael Sengpiel  investigated how ticket machines can be enhanced to make them more accessible for older adults. In his talk, he addressed that user interfaces should not be designed in a way where tasks become more complicated than it was in the past. User interfaces, which are difficult to use, make non-impaired persons disabled in the moment where they don’t know how to use it. This kind of disability affects non-impaired persons as well and therefore it is important to design user interfaces in a way everyone can understand (see Figure 4). I personally was there to present our latest work from the hciLab in Stuttgart . In this work, the performance and user acceptance of different error feedback modalities for cognitively impaired persons at manual assembly workplaces was investigated. We compared visual, auditory, and tactile feedback to find an optimum among all error feedback modalities. Our findings show, that visual error feedback was preferred the most. Participants took less time and did fewer errors when assembling a Lego Duplo building using visual error feedback compared to the other two error feedback modalities (see Figure 5). At the poster presentations, one work aims to navigate blind users during running tasks . They use the sound of the rotors as direction cue for blind runners. They evaluated the usefulness with a navigation tasks, where different spots on places have to be found. Their study proves the usefulness of using a drone as navigation instrument (see Figure 6). Conclusive I want to thank the whole ASSETS community for providing such a great experience. I met many interesting people and attended inspiring talks, which motivated me to do more research in the domain of accessibility. Congratulations go to Taylor Gotfried, who has scored the second place of the student research competition . See you all next year at ASSETS’17 in Baltimore :). : Ladner, R. E. (2016, October). Accessibility is Becoming Mainstream. 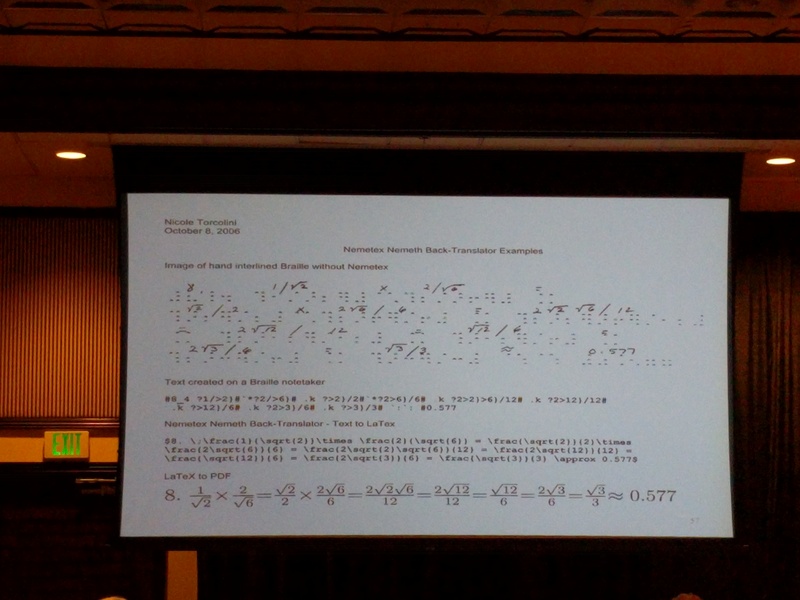 In Proceedings of the 18th International ACM SIGACCESS Conference on Computers and Accessibility (pp. 1-1). ACM. : MacAlpine, R., & Flatla, D. R. (2016, October). Real-Time Mobile Personalized Simulations of Impaired Colour Vision. 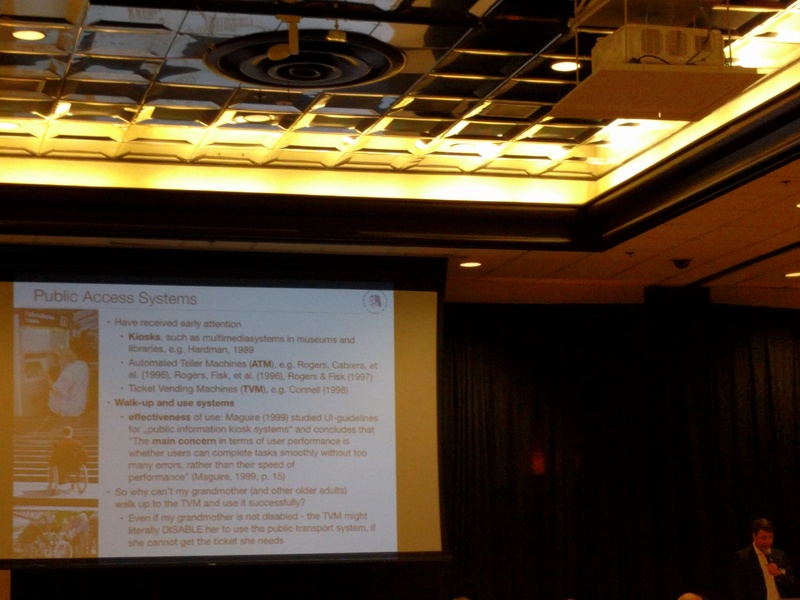 In Proceedings of the 18th International ACM SIGACCESS Conference on Computers and Accessibility (pp. 181-189). ACM. : Sengpiel, M. (2016). Teach or design? how older adults’ use of ticket vending machines could be more effective. ACM Transactions on Accessible Computing (TACCESS), 9(1), 2.
: Kosch, T., Kettner, R., Funk, M., & Schmidt, A. (2016, October). Comparing Tactile, Auditory, and Visual Assembly Error-Feedback for Workers with Cognitive Impairments. In Proceedings of the 18th International ACM SIGACCESS Conference on Computers and Accessibility (pp. 53-60). ACM. : Al Zayer, M., Tregillus, S., Bhandari, J., Feil-Seifer, D., & Folmer, E. (2016, October). 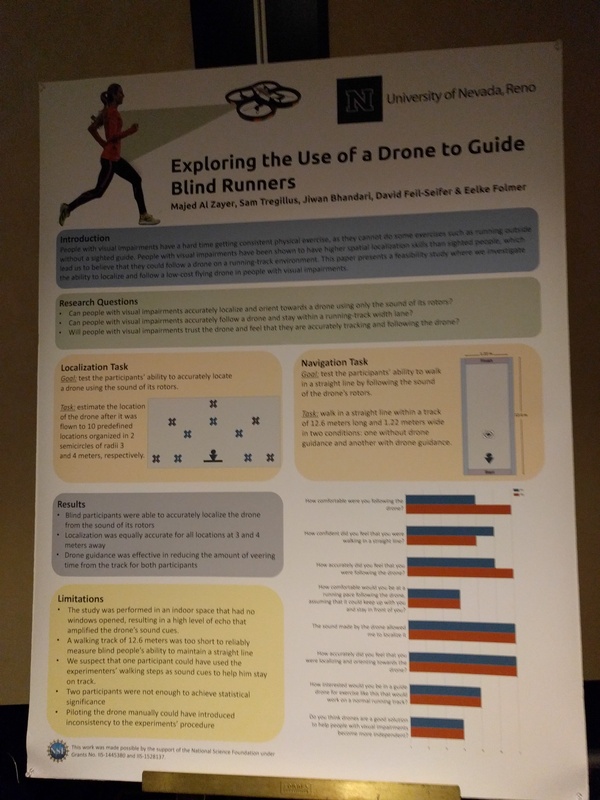 Exploring the Use of a Drone to Guide Blind Runners. InProceedings of the 18th International ACM SIGACCESS Conference on Computers and Accessibility (pp. 263-264). ACM. : Gotfrid, T. (2016, October). Games for People with Developmental Disabilities. In Proceedings of the 18th International ACM SIGACCESS Conference on Computers and Accessibility (pp. 335-336). ACM.